Heat large nonstick skillet over medium-high heat. Add sausage and diced onion; cook about 5 minutes or until onion is crisp-tender. Remove from skillet. Wipe out skillet with paper towels; spray with cooking spray. Heat over medium-high heat. Whisk egg substitute, pepper and salt into skillet. Cook 2 minutes or until bottom is set, lifting edge of egg to allow uncooked portion to flow underneath. Reduce heat to medium-low. Cover; cook 4 minutes or until top is set. 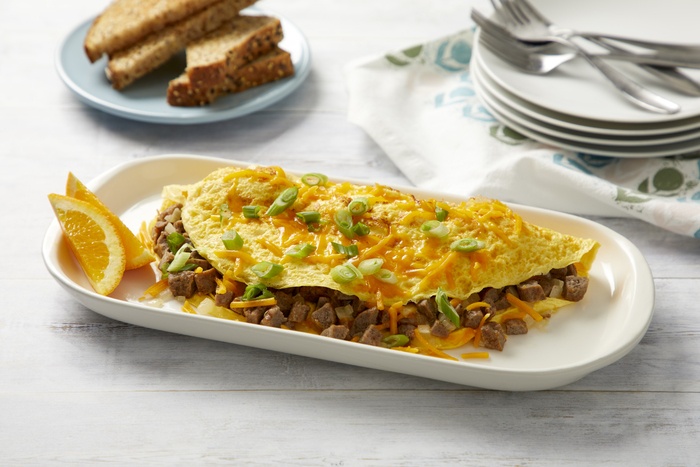 Gently slide cooked egg onto large serving plate; spoon sausage mixture down center. Sprinkle with ¼ cup cheese. Fold sides of omelet over sausage mixture. Sprinkle with remaining ¼ cup cheese; garnish with green onions. Cut into four pieces; serve immediately.